← GMOs…are you in the know? Tacos are a favorite food of mine. I love the flavors, textures and all of the colors once they are topped with fresh chopped veggies and a sprinkle of cheese. As I prepare for this 30 day cleanse, I was nervous about this favorite menu staple of mine and I am thankful I found this recipe. As a matter of fact, it was so yummy I may not go back to meat filling, even though I will still have to make it for the kids. *Please note: The photo is not of my actual dish. It is from the recipe site – I was so hungry, I forgot to take a photo of my dish. Preheat oven to 450F. To make Roasted Peppers and Onions: Toss peppers and onion with oil on large baking sheet. Season with salt and pepper. Roast 15 minutes, stir, and roast 15 minutes more, or until vegetables are tender and peppers are beginning to blacken. Transfer to small bowl. Meanwhile, make Tacos: Heat oil in large pot over medium heat. Add onion and sauté 5 to 7 minutes, or until soft. Add garlic, and cook 1 minute more, or until fragrant. Stir in beans, tomatoes, chili powder, cumin, hot sauce and 1 cup water. Season with salt and pepper. Reduce heat to medium low, and simmer 15 minutes, or until most of liquid has evaporated, stirring occasionally. Mash beans until filling is thickened, but chunky, and most beans remain intact. Adjust seasonings, if necessary. Transfer to serving bowl. 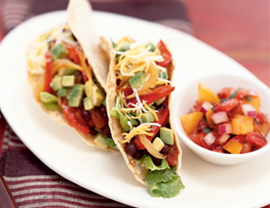 Pass taco shells, filling, roasted peppers and onions and toppings around the table. I actually didn’t have mine in a shell tonight. Instead I made a taco salad and crunched up some baked Tostitos over the top. oh these sound so good!! I don’t know if I could convince the husband to go w/out meat but I’m going to try. Maybe not tell him it’s vegetarian. Thanks!!! If you put everything in the shell for him, he would probably never even know. I made the meat anyway, for the kids and my hubs mixed some in with it.